South Africa is probably the best place on earth where to dive with sharks. 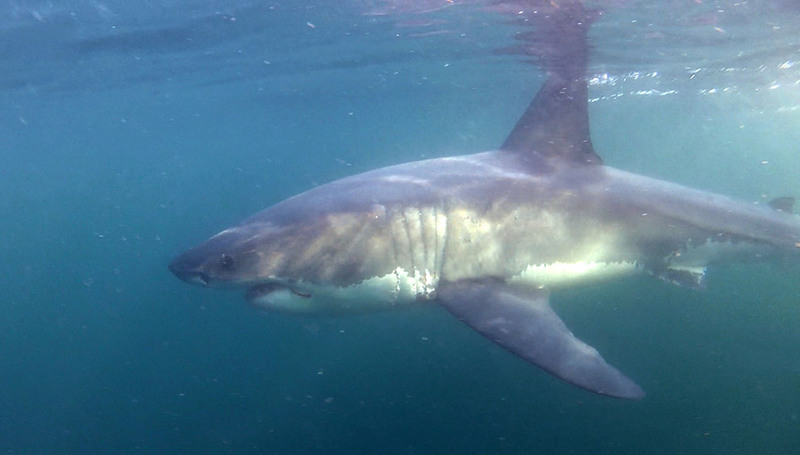 You’re not just diving with any old sharks, either—among many other species, you’ll be taking to the water with the predatory king of the ocean: the great white. Plan a two week holiday diving the following South African sites, and you might just see more sharks than you will in a lifetime of diving other locations. These are the prime spots for diving with Great Whites – in the cage if you have a family, just a snorkel and fins if you happen to be nuts. And while both are well worth visiting, False Bay is slightly less touristy, and also provides visitors the chance to dive with the cow sharks that populate in the area. 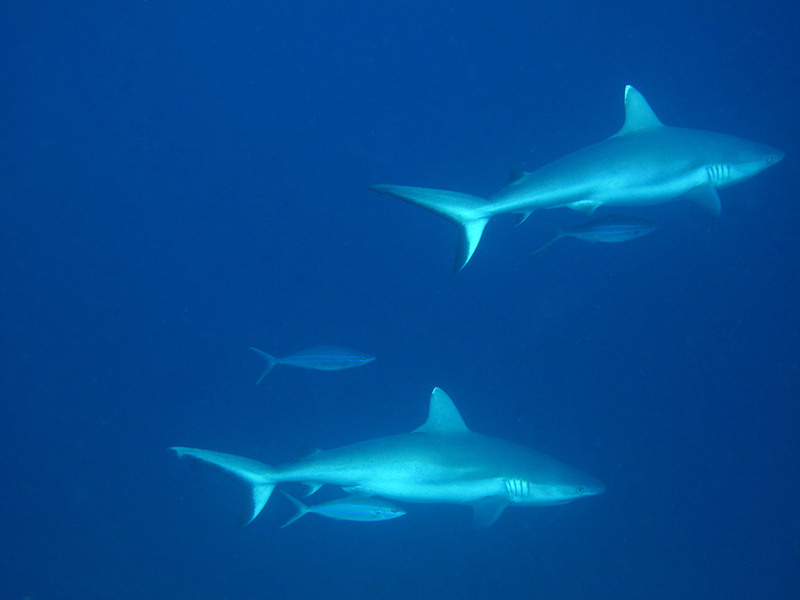 Aliwal Shoal is famous for its abundance of oceanic blacktip sharks. Every day, hundreds of divers jump into baited waters containing packs of twenty or thirty blacktips. If you’re lucky and in the right season you may also see tiger sharks. Keep an eye out for sandtiger sharks discarded teeth down in the reef sand! Protea Banks has fewer sharks in quantity, but more in variety. You’ll see blacktips for sure, but you have also stand a good chance to see bull, dusky, even tiger and hammerhead sharks if you’re there during in the right season. A dream destination for any diver, the Maldives offer so many amazing perks that it’s hard to pick out just one. However, the massive numbers of pelagics that swim here might just be the primary draw – imagine a liveaboard dive trip during which you might swim with white tips, grey reefs, nurse sharks, leopard sharks, tiger sharks, hammerheads, and even whale sharks. All during the same trip! Wherever you go, it’s almost as if the sharks are following. Diving the Ari Atoll? Keep an eye out for whale sharks. Exploring the thilas and kandus that put Maldivian diving on the map? Look for white tips and grey reef sharks. Enjoying a night dive? Shine your light on the leopard and nurse sharks lurking on the sand below you. You literally can’t dive anywhere without standing a fantastic chance of seeing one or more of the Maldives’ 26 different shark species. The dive site that I would recommend the most to see a great quantity of grey reef sharks is Warren Thila. In 1994, Jacques Cousteau said that Cocos Island was the most beautiful island on Earth. Today, the Cocos Island Marine Park is just as beautiful, and just as full of amazing sealife – 27 endemic fish species, bottlenose dolphins, California sea lions, and of course a multitude of different sharks. 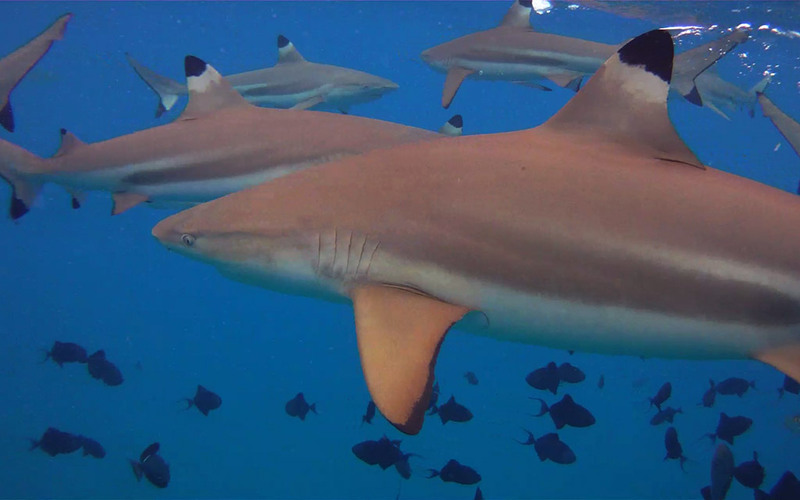 White tip reef sharks abound, and you’ll find hammerheads schooling in abundance. If you get very lucky, you may just catch sight of a massive whale shark. 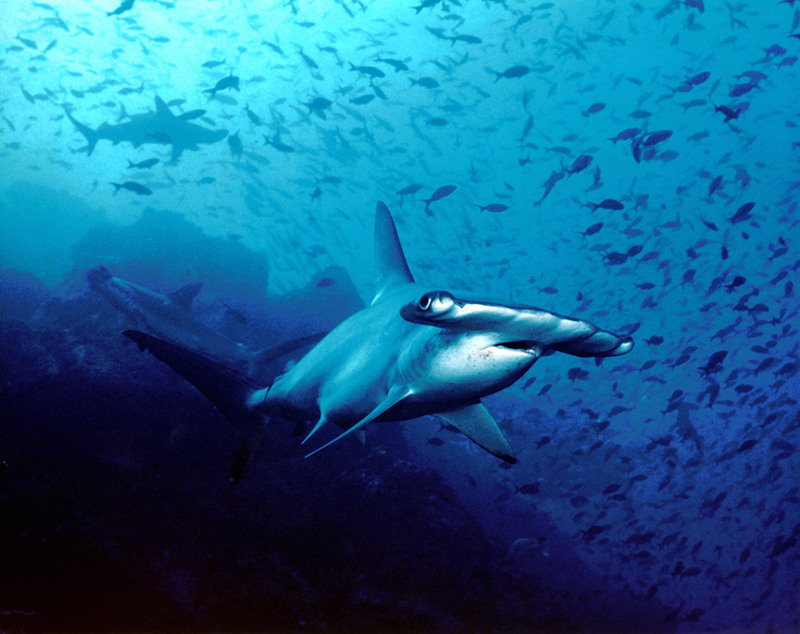 Other common pelagic encounters include silky sharks, silver tip sharks, mantas, and marbled rays. The Galapagos is a tiny cluster of less than twenty islands, best known as Charles Darwin’s field laboratory for testing and perfecting his theory of evolution. 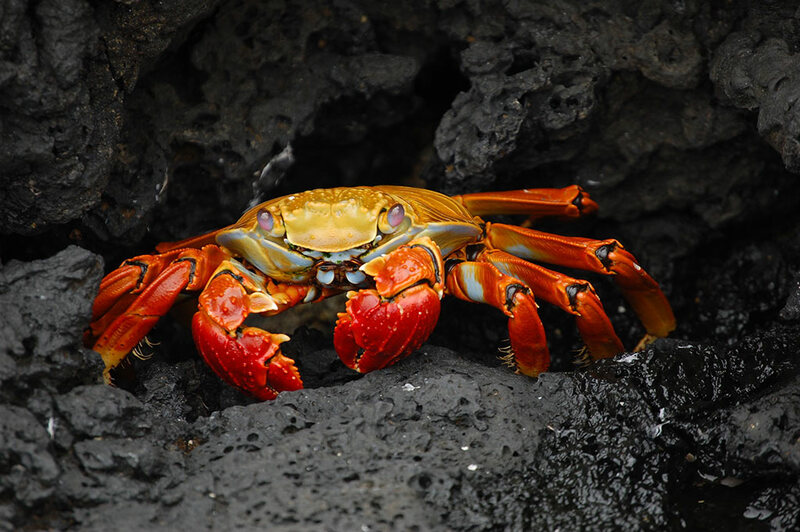 Just as it was then, the Galapagos is a major international resource where hundreds, if not thousands, of different species interact both undersea and on the islands themselves. In fact, twenty percent of the ocean fauna here is found nowhere else on earth! But for our purposes here, it’s the sharks that draw. Take the Darwin Island dive site, for example – Galapagos sharks, silky sharks, hammerheads, blacktips, and whale sharks all cruise in abundance. In fact, this site consistently ranks among the best dive sites in the world, mostly because of this pelagic population. Tiger Beach isn’t actually a beach – it’s a large strip of warm, shallow water located about twenty miles from West End on Grand Bahama. In those waters, you’ll come face to face with almost as many different varieties of shark as you’ll find just about anywhere. 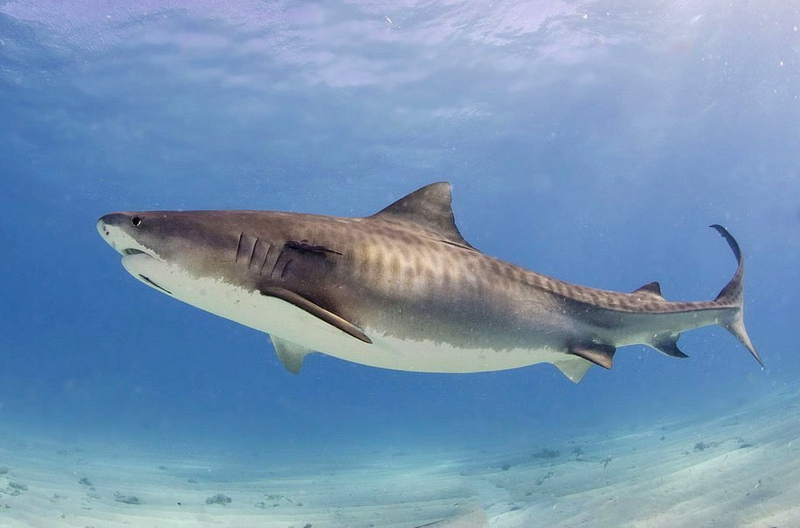 Tiger sharks are the big draw, but you’ll also find lemon sharks, Caribbean reef sharks, nurse sharks, and hammerheads. This is truly an extreme shark diving destination, with potentially dozens of them gathering once the waters are chummed. 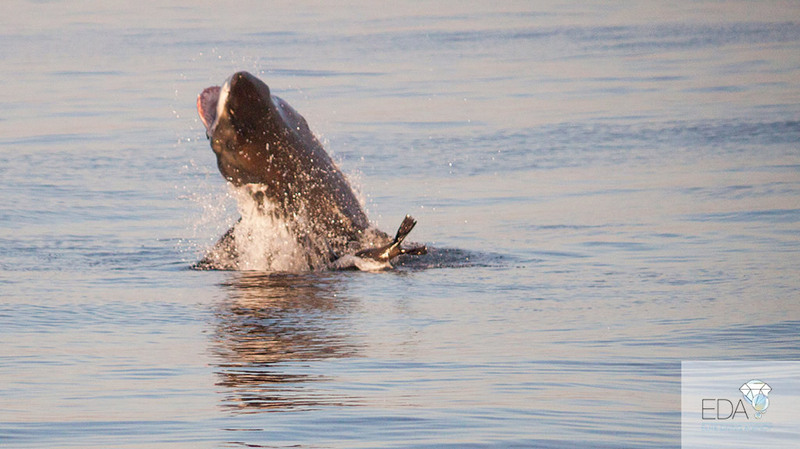 If you’re really lucky, you might catch a glimpse of a few spotted dolphins, too. Though Isla de Guadalupe has only been a well-known destination for about a decade, it is certainly worth a visit as it features the biggest of big shark dive prizes: a multitude of great white sharks. Located about 150 miles off Baja California, these waters are absolutely crawling with great whites; one recent survey counted 108 of them in one small island bay. Visibility is unreal, often over 100’, allowing for amazing photography even if the sharks don’t visit you up close. Chances are, however, that they will—many show no fear or hesitation in approaching shark cages, thanks to their frequent exposure to divers. These four small islands lie at the mouth of the Spencer Gulf in South Australia, and serve as home to massive breeding colonies of New Zealand fur seals, as well as a group of Australian sea lions. Which, of course, attract the great whites that populate the surrounding waters. 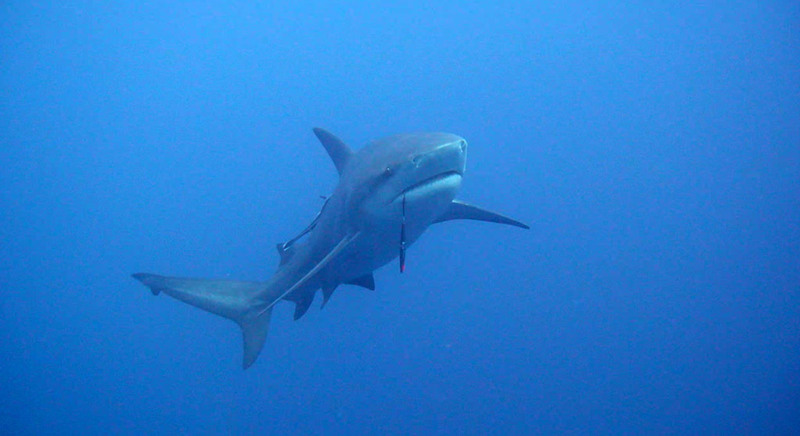 One important note: you don’t actually need to be a certified diver to cage dive with great whites here—or most anywhere else, for that matter. Air is usually fed to divers hookah style from the surface, allowing for hours-long dives and a more egalitarian experience than most extreme underwater adventures. Not a bad thing to keep in mind when travelling with your favorite non-diver – feel free to trick them down into the cage with you. Rangiroa, located northeast of Tahiti, is the second-largest atoll in the world, with about 415 individual land masses scattered amongst a hundred narrow passages in the surrounding reef. Also scattered in those passages? Sharks – a ton of them. It isn’t uncommon to happen upon massive feeding events in which large schools of baitfish are besieged by packs of barracuda, tuna, and snapper, as well as dozens of grey reef sharks. You can easily find yourself in the middle of just such an event, with fish teeth snapping all around you. This makes for some very intense dives, and is definitely not for the faint of heart. Just remember: they don’t want to eat you. And don’t forget your camera! This protected reserve in the middle of Belize’s Barrier Reef features the Spit itself, a promontory with a sloped shelf that falls away quite steeply, as well as some of the healthiest reef features in the Caribbean. 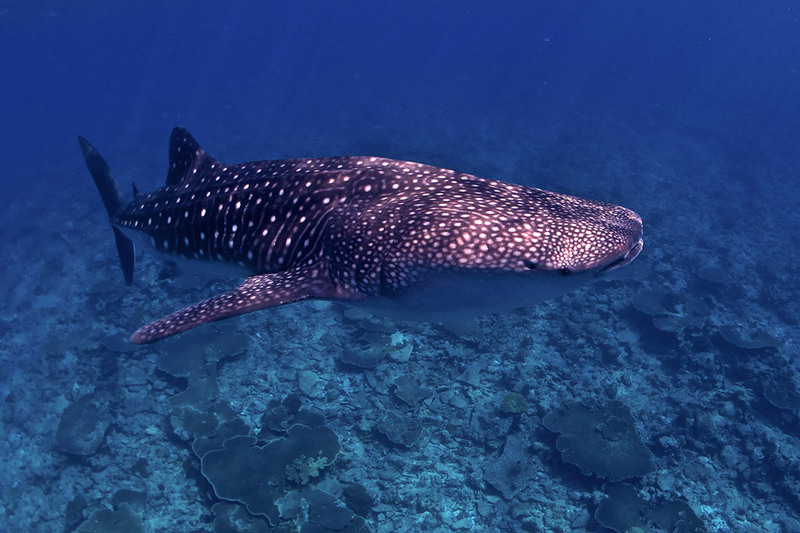 The area also boasts a very unique opportunity for divers: the chance to swim with whale sharks, those gentle giants of the deep. Whale sharks are the biggest fish in the ocean, reaching lengths of more than 60 feet; in a lifetime of diving, chances are you will never come in closer contact with a larger creature. The sharks congregate around the Spit thanks to the dozens of fish species spawning there between March and June. You could certainly go another time of year – the waters are simply spectacular all year long – but if you’re passing up an opportunity like this one, why would you come any other time? In 2001, Palau Shark Sanctuary was founded to help end widespread shark killing in the form of finning – catching sharks, cutting off their fins, and simply tossing them back into the water to their deaths. Today Palau is on the cutting edge of shark preservation, and its main weapon in this quest is its tourist industry, which creates more demand for live sharks than for dead, defined ones. Diving with Palau’s sharks is a little less contrived, and thus a little more dangerous, than shark dives at some of the other destinations mentioned here. There’s not as much baiting and feeding, and cages are not as prevalent. Sites like the legendary Blue Corner, an expert-level dive that drops you right into the strong currents that attract large pelagic predators, will stay with you long after you’ve gone home. Just stay as still as you can and watch the hammerheads, leopard sharks, and oceanic white tips do their thing.